Christina Sarich is a humanitarian and freelance writer that has broken numerous health-related news stories. Some of her biggest pieces revolve around exposing the fraud and lies told by Big Food and Biotech. If you want to learn how food companies are tainting the food supply with toxic ingredients or how genetically modified foods are leading to the downfall of our food supply. Christina’s articles are must-reads. Her blog is Yoga for the New World, and her latest book is Pharma Sutra: Healing the Body and Mind Through the Art of Yoga. University of Minnesota researchers say that people are more likely to purchase a healthy food if it is labeled with a symbol suggesting it is healthy, as opposed to having the actual word healthy on it. One of Mann’s studies involved 400 adults in a lab setting, where 65% of the participants took an apple instead of candy if there was a heart symbol on it. Only 45% of adults chose an apple if the fruit was labeled with the word healthy. In another study involving 300 adults and carrots, Mann and her colleagues found just 20% of participants chose carrots over chips when the carrots had healthy on them. But when the carrots were labeled with a heart symbol, 30% of the adults chose them over candy. The researchers also took their experiments to elementary school cafeterias. They found children were 4 times more likely to eat broccoli or red peppers if the vegetables were served first. The students were far less likely to choose the vegetables when they were served alongside other food offerings. The team got the same results when they tried the experiment in a lab setting and offered various snack foods alongside veggies. The findings were presented at the Society for Personality and Social Psychology’s 17th Annual Convention in San Diego. “What these results show us is that rather than leading dieters to make healthier choices, these food police messages are actually making unhealthy foods even more enticing to dieters,” said researcher Nguyen Pham of Arizona State University. According to the team from Arizona State, there is “a real danger in using messages that convey only negative information about food.” One can only assume when researchers refer to “negative information,” they mean many people think healthy food is flavorless and unsatisfying. ‘Tricking the brain’ can be a useful tool. I pulverize fresh spinach and put it in my spaghetti sauce to trick my leafy-greens-hating hubby into eating it. He thinks all that green stuff is just herbs and spices. If he saw me do it or I called it spinach pasta sauce, he’d never eat it. A study conducted by Dr. Nicole Avena of the Icahn School of Medicine at Mount Sinai, has found that sugar consumption and addictive behaviors are closely linked. Just how bad could a sugar addiction be, you ask? Sadly, the study suggests that it’s eight times more addictive than cocaine. If that doesn’t make you want to skip that cola purchase, I don’t know what will. Couple these findings with the fact that most Americans ingest approximately 22 teaspoons of sugar daily, and it’s clear that the findings are indeed highly disturbing. Even worse is the consumption by teenagers; it’s estimated that this age group consumes about 34 teaspoons of it every day. Soda has been eyed as the most common culprit behind so much sugar ingestion, with other junk food choices like cookies not far behind. Unquestionably, people are flocking to sugar like it’s going out of style, and now we know why – it’s an addiction. … addictive substances are altered to increase the rate at which the addictive agent is absorbed into the bloodstream. For example, when a coca leaf is chewed, it is considered to have little addictive potential. However, once it is processed into a concentrated dose with rapid delivery into the system, it becomes cocaine, which is highly addictive. Similarly,highly processed foods, compared to naturally occurring foods, are more likely to induce a blood sugar spike. This is important, because there is a known link between glucose levels and activation of areas of the brain that are involved with addiction. … the addictive potential of a food is likely to increase if the food is highly processed to increase the amount, or dose, of fat and/or refined carbohydrates and if the refined carbohydrates are absorbed into the bloodstream quickly (high GL). An essential next step in the consideration of “food addiction” is to determine which foods or food attributes pose the greatest risk in the development of addictive-like eating behaviors in humans. According to Dr. Avena, pizza is the most addictive food. Just one slice contains more sugar than a few Oreo cookies, thanks to the hidden sugar in the tomato sauce. Now, we all know that most people don’t just stop at a mere slice. In fact, we’ve all probably seen folks devour an entire pizza on their own, which is likely akin to polishing off an entire box (or more) of Oreo’s … not good. Furthermore, what do most people enjoy drinking with their pizza? You guessed it – soda! As mentioned earlier, people are downing such liquid sugar more today than ever before, demonstrating our collective dependency on the unhealthy substance. After pizza, Dr. Avena explains that cookies, ice cream and chips also rank high among the most addictive foods. They too, have a sugar content that impacts the brain in a way that mimics drug and alcohol addiction. The least addictive foods, according to the study? Eat more cucumbers, carrots and beans; they’re the least addictive, and therefore, are healthy choices to include in your diet. These findings reinforce the importance of avoiding a junk food diet, and instead, enjoying one that consists of fresh, organic options. Fruits and vegetables, along with a variety of nuts, seeds and superfoods, are the best choices to keep your health on track and even reverse certain ailments. Why feed your body a substance that’s eight times as addictive as cocaine, when you can take the better path and live the healthier, longer life you deserve? The great American novelist Norman Mailer once said, “I sometimes think that there is a malign force loose in the universe that is the social equivalent of cancer, and it’s plastic. It infiltrates everything. It’s metastasis. It gets into every single pore of productive life.” You would think this was a recent quote, something he might have said after the green movement became popular. But no – he said this in 1983, before America’s obsession with everything plastic was even close to reaching its peak. What amazing foresight he had. 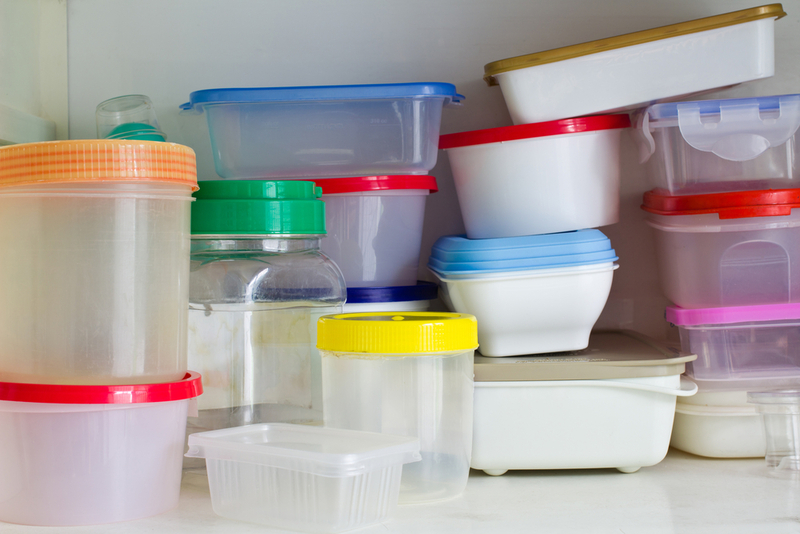 The pundits will say that the human body can easily handle the “small” amounts (which the government insultingly likes to call “acceptably safe levels”) of toxins that are ingested from plastic. But I find this excuse to be one of the world’s biggest cop-outs. If the human body wasn’t designed to ingest plastic, then no amount is good. Period. You can click here to read my appeal to the U.S Government to ban BPA now! Joshua Corn is the Editor-in-Chief of the natural health and wellness site, Live in the Now. Josh is a health freedom advocate and veteran of the natural health industry. He has been actively involved in the natural health movement for over 15 years, and has been dedicated to the promotion of health, vitality, longevity and natural living throughout his career. Josh has successfully overcome several personal health challenges through natural means, and believes that sharing information can empower people to take control of their health so they can solve their own problems and live life to its fullest potential. Josh is the founder and Editor-in-Chief of Live in the Now. Additionally he serves as CEO of SAN, a company that has been formulating premium dietary supplements since 1995. Josh is currently working on his first book about natural health, and gearing up to launch the Live in the Now radio show. In addition to his work in the natural health field, Josh is an avid outdoorsman, yoga practitioner, animal lover and father of two sons who remind him every day to “live in the now”. Whoever coined the phrase “Beauty hurts” obviously had the latest Chinese spa treatment in mind. 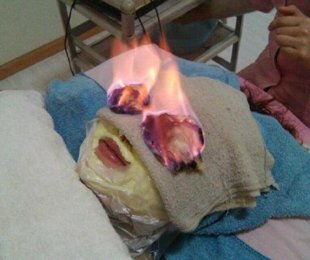 A beauty ritual called Huǒ liáo (meaning fire treatment) that’s lauded for curing everything from dull skin around the eyes to obesity has spread like, er, fire around the blogosphere after a photo of a woman with her face ablaze was posted to the Chinese message board tt.mop. We don’t blame her. Huǒ liáo allegedly involves soaking a towel with a “secret elixer” and alcohol and placing it on a “problem area” such as the face, legs, back, and neck and setting the towel on fire for several seconds before extinguishing it with another cloth. While the origins of this treatment are unclear—some credit China, others Tibet— it’s said to be painless and depending on what part of the body it’s applied, reportedly flattens the stomach, boosts metabolism, smooths wrinkles, and helps combat ailments such as the common cold and flu, indigestion, insomnia, joint pain, and fever. The real danger, according to Teitelbaum, is hair catching on fire or the skin developing hyper pigmentation. “You don’t want to be anyone’s first client or you might be their last,” he says.